Zip Screen has become a reputed name for high-quality outdoor screens. The products we manufacture are preferred across Canada. 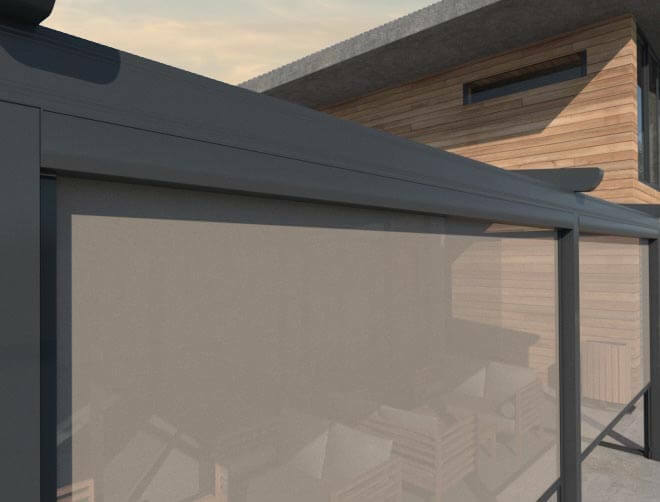 Here, you will find all the information related to the product we design and the most compelling reasons why you should consider getting them..
As the name suggests, Zip screens are outdoor blinds that can be easy retracted. Not only they can go back to the original position but also can be set at any level. Retractable screens roll back in their original shape vertically. They are elegant, modern and sophistic at the same time. A patio, without a doubt, is an appealing corner of a home. You can use our vertical retractable patio screens to upgrade the look and add a touch of modernity to your outside space. This type of retractable outdoor screens is designed to give enhanced privacy. They block views from the outside while giving enough visibility from the inside. At Zip Screens, we thrive to provide the best products to our customer. Therefore, highest-quality fabric from a brand Dickson is used in our ZIP Screens. The fabric used for making all types of retractable outdoor screens is solar-protective. Thus, it minimizes the effects of harmful ultraviolet rays emitted by the sun. Despite being transparent, the fabric material enhances privacy. Furthermore, it is also known for its thinness and thermal comfort. Dickson offers a 5-year warranty on the fabric; thus, you can rest assured that your zip screens can last a long time. You can order any size of outdoor retractable screens from Zip Screens. This makes our vertically retractable outdoor screens suitable for every setting. Zip screen can be installed on the pergola, loggia, veranda, or balcony so you can enjoy in open- air living. We will make sure to fit your space! A prominent feature of our vertically retractable outdoor screens is that they have a specialized zip system application. The benefit of this system is that it keeps the screen affixed. 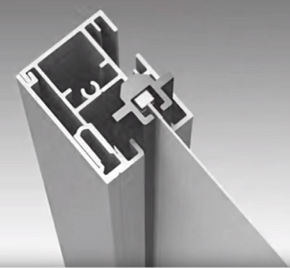 The system features a track that keeps the screen firm in place as it locks the position of the screen and tension the fabric inside the rail. A Manual ZIP Screen is operated by the gear box with the handle crank. A motorized zip screen offers a hassle-free control over the opening and closing of screens, while manual operation provides a more traditional look. Whether you are looking for outdoor screens with manual or motorized control, at Zip Screens we offer both applications. Based on the requirement of the client, we can manufacture outdoor screens that perfectly fit their preferences. Many people leave the idea of having outdoor screens because they believe that this application can not withstand different weather conditions. 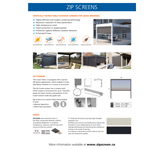 However, Zip Screens offers retractable screens that are strong and durable enough to sustain Canadian weather. Whether its raining or snowing, screens will stay firm at their place because of the advanced technology used in their manufacturing. Furthermore, they can withstand wind at a speed of 130 km/h. This particular feature of our vertically retractable outdoor screens makes them the best ones available for your home or office. Privacy is one of the major concerns for people who want to enjoy the weather in their home’s outdoor space. By getting our specialized vertical retractable privacy screen, you can now enjoy the weather freely without having to worry about peeks and glares of others. As stated above, our screens offer more privacy without blocking your vision. Therefore, they make for a great option for your home’s patio, balcony or veranda. Apart from privacy, the major concern for people when they want to enjoy the weather outside is insects. Apart from giving a rather disturbing feeling, they can become a cause of numerous diseases and infections. Therefore, many people avoid sitting in open-air places during the summer. With our outdoor screens, you will face no such issue. Zip screen shields the outdoor space against insects, without sacrificing view or privacy. Thus, you can enjoy the weather peacefully without having concerns about unwanted bugs and mosquitos. The best part of our outdoor screens is the modern and sophisticated appearance. They can improve the view of any type of setting because of their contemporary, appealing look. Whether you have idle space in your balcony, backward or lawn, get these extremely effective outdoor screens installed to enhance its appearance up to a great extent. For patios, we have special vertical retractable patio screens that can add an element of modernity and sophistication to that particular area. Reading a book, listening to your favorite music or spending quality time with your loved ones on the patio will be much better if you are getting our outdoor screens installed.